Random Person: What do you do? RP: What do you write about? Me: Mercury poisoning caused by amalgam fillings. RP: Really? Why did you choose that topic specifically? Me: Because I experienced it, I got sick from my amalgam fillings. I answer the usual questions: How sick did I get? What were my symptoms? How did I get well? My lines don’t vary a lot. What’s interesting is hearing other people’s reactions to what I say. It’s a lonely place, being the only person you know who has an unusual medical condition. People with more common diseases can congregate, go to support groups, run into each other at the doctor’s office. But it’s not very likely that a mercury toxic person will find something helpful at a doctor’s office. They’re far more likely to have a trained medical professional tell them to their face that they’re probably making their whole story up, because it’s not possible to get mercury poisoning from dental fillings. When things like that happen, it can be tempting to start doubting, to wonder if your experience of reality is true. At times like that, a book like Solving the Puzzle of Mystery Syndromes comes to the rescue. It was compiled and edited by Mary Davis, a member of Dental Amalgam Mercury Syndrome (DAMS). 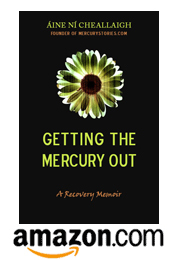 A fellow sufferer of mercury toxicity, she has done a great job putting together over 50 personal accounts of mercury toxicity due to amalgam fillings. Whatever your symptoms are, chances are high you’ll find one or two people in this book who’ve suffered from them too. The focus of this book is improvements in health brought about by safe amalgam removal. Besides the personal case histories, there are informative articles on the dangers of amalgam, and precautions that should be taken to minimize mercury exposure during amalgam removal. This book doesn’t get into the details of how to detox mercury after amalgams are removed, and doesn’t represent the segment of the toxic population whose mercury symptoms increase after amalgam removal, but I still highly recommend it. It’s a great tool for fighting back against that horrible feeling that nobody hears you, or can understand what you’re really going through.